1, Take the folding bracket and pad from the box. 2, Please rotate the bracket at a little angle, force both sides along the rack's connecting shaft, hearing a "click", support slats in the Appropriate place. Every side do as the same step. 3, Check some small notches and a biggest notches on the pad, please insert the pad into the biggest notches. 4, After installing, the CD shelf can be upright or lay on the desk. 5, Slide the small notches on the convex ridges, choose a kind of the suitable angle. It is suitable for the bigger size things to store. This is the ultimate gaming peripherals for PS/XBOX series. It is universal, can hold almost every games disc/DVD/CD/Blue-Ray discs etc. It can store 11 CDs/Discs, easy to refer to the CDs' content, collect CDs and take it out from the stand. Also can work as small book shelf or bigger size things to store. Easy assembling, and space saving. Let you free from disorder, save room on desk or shelf. Can be used in 3 different modes and multiple angles. This storage holder will indicate what is inside and cannot be hidden. 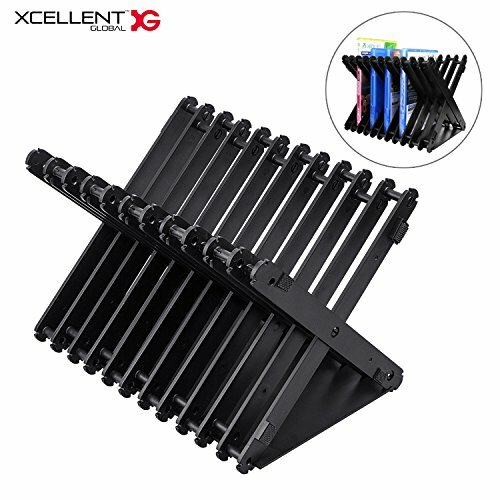 If you have any questions about this product by Xcellent Global, contact us by completing and submitting the form below. If you are looking for a specif part number, please include it with your message.